Being diagnosed with heart failure can be scary. "I didn't realize how severe this sickness is." being forty-nine, this is not happening." Knowing what heart failure is and how it affects your body can help to relieve some of your fears so you can take the steps you need to reduce your symptoms and feel better. Heart failure is a weakening of the heart that can develop over a long period of time. Heart failure does not mean your heart has stopped or is about to stop. To learn more, let's take a look at how the heart normally works. The heart is a muscle that pumps oxygen and nutrient-rich blood through your body. With an oxygen-rich supply of blood, your body can carry out the normal activities of daily living. However, when you have heart failure, your weakened heart can't pump enough blood to meet your body's needs. To make up for the weakness, your body releases chemicals, called hormones, that help your heart pump. These hormones are helpful for the short term, but over time they change your heart, reducing your heart's pumping ability even more. 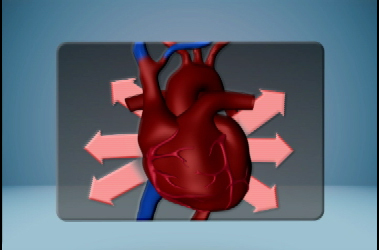 When your heart isn't pumping blood effectively, less blood gets to all parts of the body. Your muscles weaken and begin to waste away, causing fatigue or tiredness. Your kidneys hold onto sodium and water. This increases fluid in your blood vessels. As more and more fluid builds up in the blood vessels, fluid begins to seep into surrounding tissues. This fluid can leak into your legs, ankles, feet and waist, causing congestion and edema, or swelling. And when the fluid leaks into your lungs, it is called pulmonary edema. All these changes can lead to symptoms, including: shortness of breath; cough; fatigue; sudden weight gain of two to three pounds in one day, or five pounds in a week; increased heart rate and increased thirst. Your heart failure may have been caused by high blood pressure or heart conditions, such as: coronary artery disease, heart attack, faulty heart valves, or a heart muscle disease called cardiomyopathy. Other heart disease risk factors, such as high cholesterol, diabetes and smoking can increase your risk of developing heart failure. Smoking also damages your heart; so if you smoke, you must quit. By knowing what heart failure is and how it affects your body, you can make heart healthy choices each day to reduce your symptoms. Heart failure may be scary, but you can take steps to keep it in control and feel better.